After several days of having the Reeven Okeanos RC-1402 in my computer, I found myself really enjoy using this product. The dual fans design provides excellent CPU cooling performance. Because the heatsink cooling performance is so good, both fans are operated at very low RPMs in majority of the time, therefore the noise level of is kept low. Previously, when I had a single fan CPU cooler on my motherboard, I knew exactly when my computer was at high CPU workloads. It was because I could always hear the CPU fan started to speed up. However, after I installed the Okeanos RC-1402 in my computer, I found the noise level was kept consistently low. Along with the outstanding CPU cooling performance and the low noise level, the other thing I enjoyed with this product is the appearance. I like the way the Okeanos RC-1402 looks. It has a stylish design, and more importantly, the size is big enough to take up the empty space in my computer case. Well, not everybody wants their computer case to be packed up with stuff, but I really enjoy the view of a big CPU cooler in the case. I cannot wait to put three 140mm fans on the Okeanos RC-1402. The one thing I think that can improve this product is the wire clips. I would prefer to have the wire clips with tabs on them, so the fan installation experience can be improved. At press time, the Okeanos RC-1402 has a $77 USD price tag, which is not cheap, but reasonable for what you get. 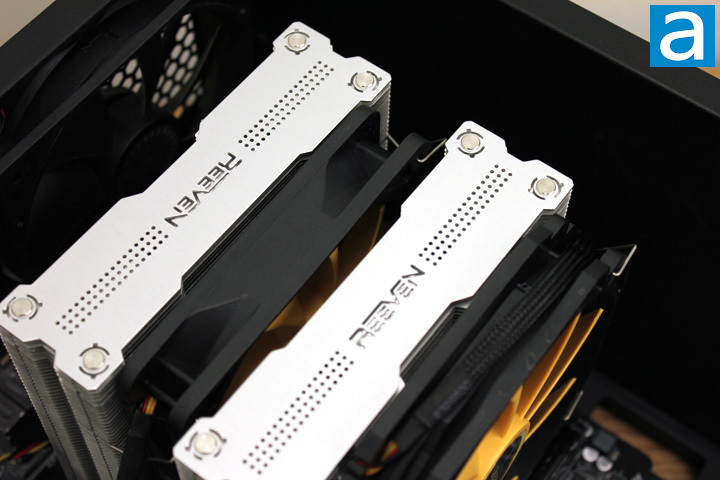 If you need an air-cooled CPU cooler with excellent performance and do not mind having a chunky combination of fans and a heatsink in your case, the Reeven Okeanos RC-1402 is highly recommended. Reeven provided this product to APH Networks for the purpose of evaluation. Do you have any comments or questions about the Reeven Okeanos RC-1402? Drop by our Forums. Registration is free, and it only takes a minute! posted 3 hours and 39 minutes ago, with 1 posts. posted 3 hours and 39 minutes ago, with 2 posts. posted 3 hours and 40 minutes ago, with 8 posts. posted 3 hours and 40 minutes ago, with 7 posts. posted 3 hours and 44 minutes ago, with 15 posts. posted 3 hours and 44 minutes ago, with 59 posts. posted 3 hours and 44 minutes ago, with 14 posts. posted 3 hours and 45 minutes ago, with 11 posts.